Today I want to share with you one of my favorite holiday traditions that I used in the classroom and now plan to continue with my personal kiddos: I wrapped up 25 Christmas picture books and each day in December we unwrap a book to read. 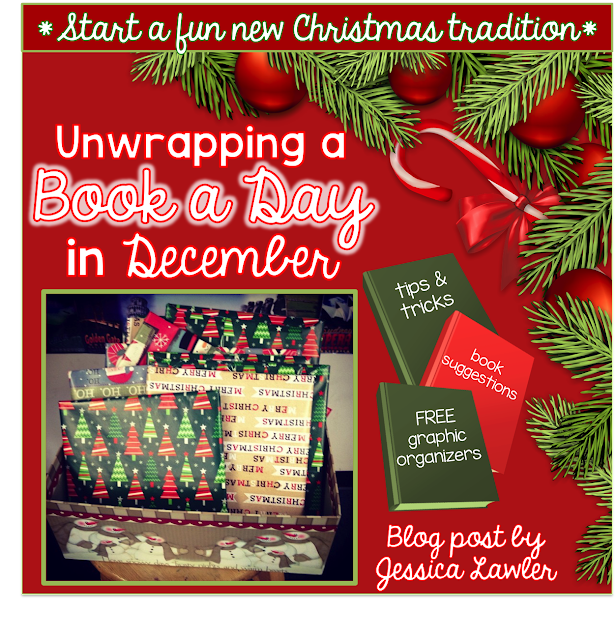 This was such a fun part of our day - it helped to foster a love of reading and stressed the idea that books are gifts to be treasured. Most of the books I used came from my personal library - but I also recognize that not everyone is a children's book hoarder like I am :) To gather 25 books, you can borrow from friends, check some out from the library, scour second hand stores, garage sales, or used book stores for great deals on Christmas picture books. Note: these are not books for the kids to keep - we just read them and they stay in our classroom to be enjoyed throughout the month of December. To use with my own kids, I will not be buying 25 new books each year - we will wrap and read the same ones (with a few books swapped out as new books are published) each year. Tip: Each January I use my leftover Christmas wrapping paper to wrap the books. I put them away with my Christmas decorations so that next Christmas, the books are wrapped and ready to go! 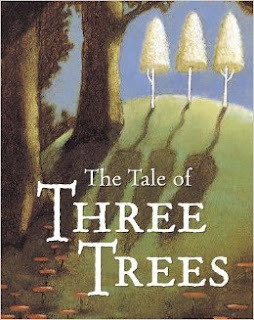 When the woodcutters come, the trees each find that the reality of their existence doesn't match their dreams… and yet they soon realize they were meant for so much more. This touching story contains a simple lesson about God's Plan for every life, told in a way that will touch hearts. 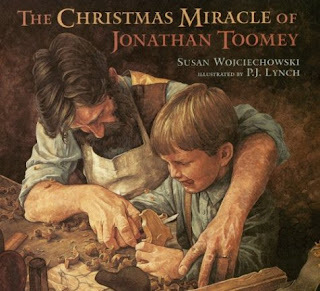 The Christmas Miracle of Jonathan Toomey: Jonathan Toomey is the best woodcarver in the valley, but he is always alone and never smiles. No one knows about the mementos of his lost wife and child that he keeps in an unopened drawer. But one early winter’s day, a widow and her young son approach him with a gentle request that leads to a joyful miracle. The moving, lyrical tale, gloriously illustrated by P.J. Lynch, has been widely hailed as a true Christmas classic. The Night Before Christmas: In this famous poem, Saint Nicholas visits a sleeping household on Christmas Eve. 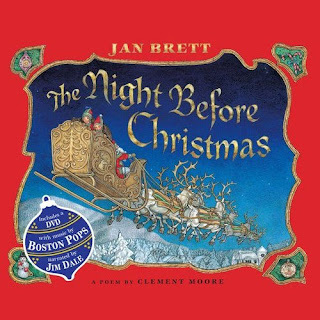 This classic poem The Night Before Christmas is undeniably the most widely recognized Christmas ditty of all time. Moore's words evoke images of warm, fuzzy Christmases, long before the invention of TV and microwave turkey. 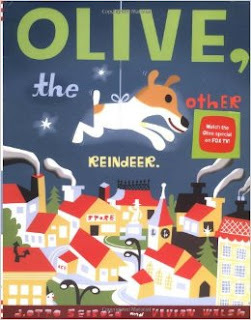 Olive the Other Reindeer: Olive is merrily preparing for Christmas when suddenly she realizes "Olive... the other Reindeer... I thought I was a dog. Hmmm, I must be a Reindeer!" So she quickly hops aboard the polar express and heads to the North Pole. And while Santa and the other reindeer are a bit surprised that a dog wants to join the their team, in the end Olive and her unusual reindeer skills are just what Santa and his veteran reindeer team need. 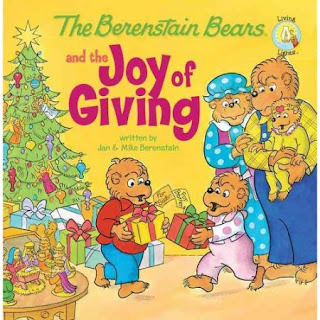 The Berenstain Bears and the Joy of Giving: a classic, but still a good one! Brother and Sister Bear can’t wait for Christmas and all the presents they’ll open. But during the Christmas Eve pageant, something special happens! The Bear cubs learn a very valuable lesson about the joy of giving to others. Snowmen at Night: Have you ever built a snowman and discovered the next day that his grin has gotten a little crooked, or his tree-branch arms have moved? And you've wondered . . . what do snowmen do at night? This delightful wintertime tale reveals all! 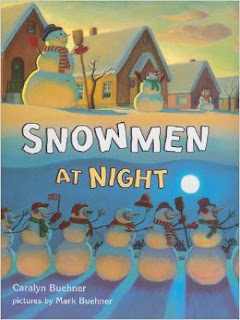 Caralyn Buehner's witty, imaginative verse offers many amusing details about the secret life of snowmen and where they go at night, while Mark Buehner's roly-poly snowmen are bursting with personality and charm. 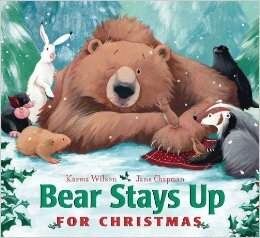 Bear Stays Up for Christmas: Bear’s friends are determined to keep Bear awake for Christmas! So they wake Bear up and have him help them find a Christmas tree, bake cakes, hang up stockings, and sing Christmas songs. Bear stays up—by discovering that giving is one of the best Christmas presents of all! Ok I could go on and on - but I'll stop myself there :) If you need further recommendations, please let me know! And if you'd like to take this fun project to the next level, you can have your students fill out a graphic organizer as you read. This provides listening accountability, valuable reading comprehension practice, as well as some informal assessment for the teacher. 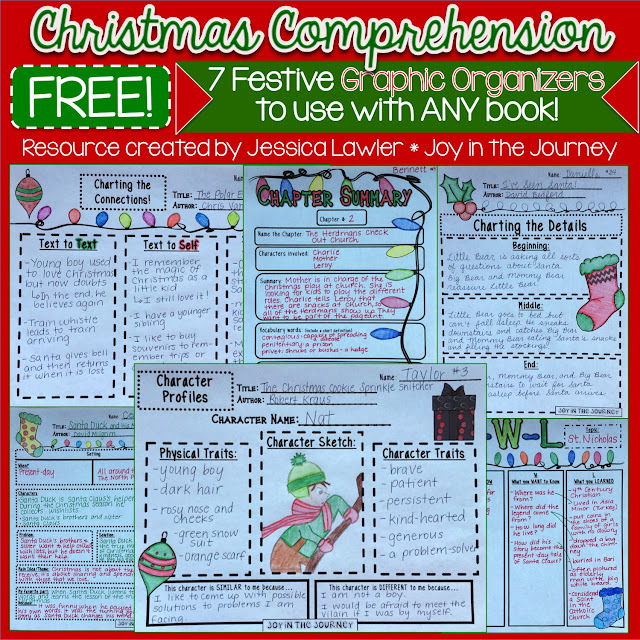 I have created a *FREE* packet of fun and festive graphic organizers that you can use for ANY holiday-themed book. 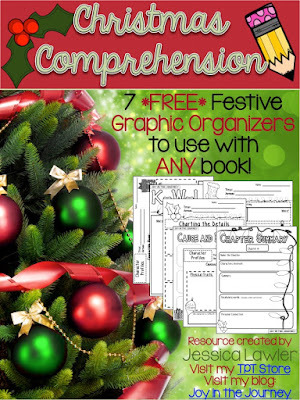 There are 7 graphic organizers for you to use again and again! 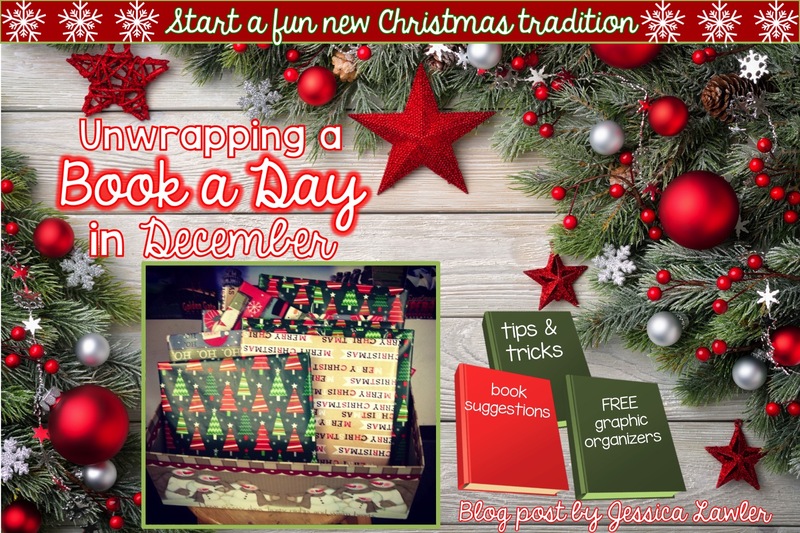 These pages were wonderful resources for me to have on-hand in the classroom in December. At the beginning of the week, I would choose a couple and copy class sets. 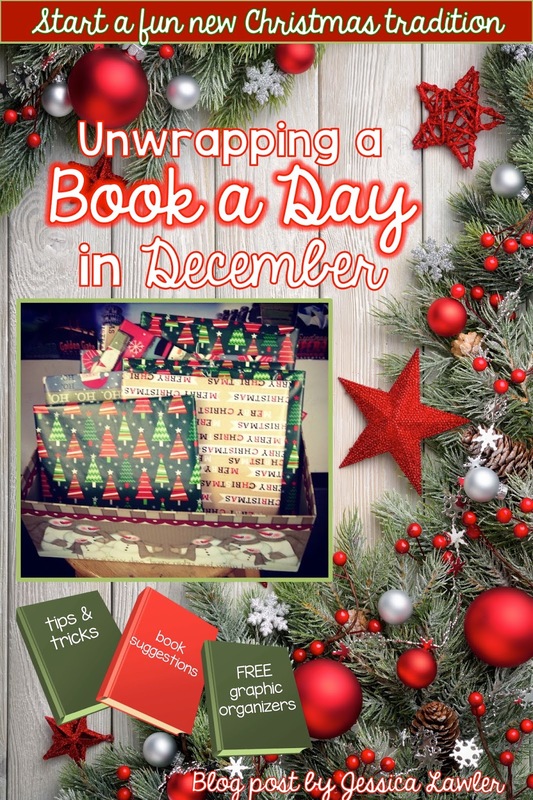 Then, if we had a spare 15 minutes before lunch or if a parent volunteer came in, I (or the parent) could read a book we unwrapped while the students filled in their graphic organizer. If you download and use the graphic organizers, please leave feedback.